Videogames have always been children of science. The earliest games were written on punch cards in university laboratories and played on enormous computer mainframes only available to researchers. Now the entire videogame industry is dependent on technological breakthroughs brought about by unfaltering scientific progress. 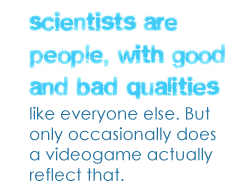 But what have videogames given science in return? Take the world's most famous videogame scientist, Dr. Gordon Freeman. Despite holding a Ph.D. in theoretical physics, he's no more a scientist than Mario is a plumber; as the silent protagonist of a first-person shooter, Freeman is essentially just a gun on a stick. His Half-Life colleagues don't win any Nobel Prizes for personality, either. The game's late-'90s graphical limitations meant its scientists are based on only four different character models, all wearing an identical uniform of a lab coat and tie. That conventional garment is a handy visual shortcut to fall back on when you need a character to scream "scientist," especially when graphical fidelity is limited. Drs. Light and Wily from Mega Man, Professor E. Gadd of the Mario universe and Pokemon's Professor Oak are all basically old white guys in lab coats. This stereotyped image isn't limited to videogames, of course; it's found in film, television and pretty much every other medium. Research shows if you ask a child as young as 8 to draw a scientist, you'll most likely get some combination of beard, crazy hairdo and glasses ... all adorning an old white guy in a lab coat. So what? Does it really matter if the media is filled with clichÃ©d scientists conducting crazy experiments? Yes - because fictional scientists influence the way people view real scientists. If children don't have scientific role models they can relate to, they might reject future careers in science. Likewise, if adults are bombarded with caricatures like Doc Brown or Dr. Frankenstein, they might begin to dismiss all scientists as weird and dangerous. With important scientific issues like climate change and stem cells dominating the headlines, we can't afford people to think scientists are all madmen trying to take over the world. That's not to say every fictional scientist should be a flawless savior of humanity. Scientists are people, with good and bad qualities like everyone else. But only occasionally does a videogame actually reflect that.